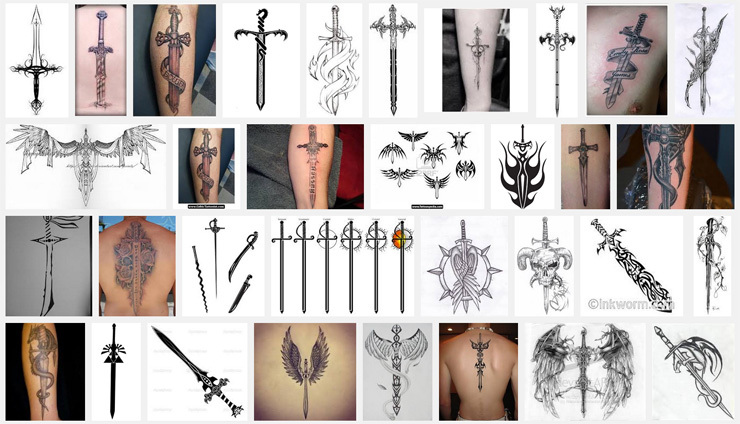 Having a sword tattoo is a way to demonstrate strength, authority, and even your cultural heritage. 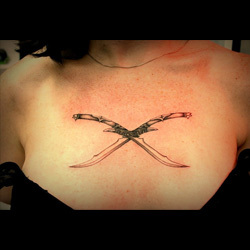 There are a variety of different ways to incorporate swords into a larger tattoo design, or they can stand on their own, often placed on a wrist, shoulder, or over the heart. 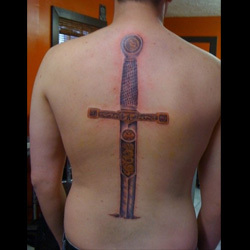 Sword tattoo designs can be customized in a variety of ways, making this a great tattoo choice for anyone hoping to have a truly unique piece of art on their body. 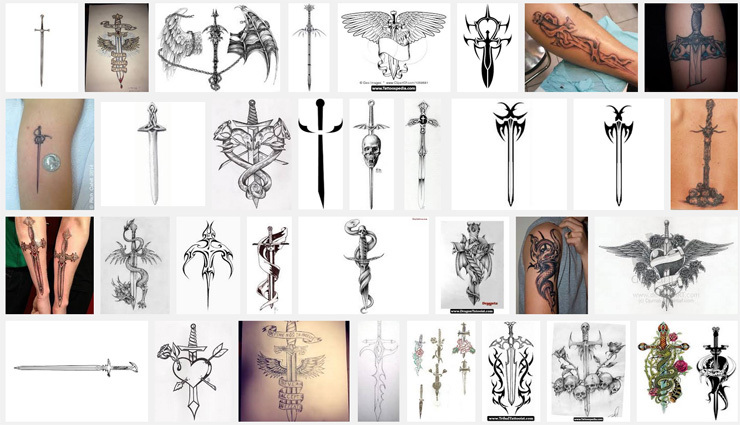 Several different variations for sword tattoos exist, making this an infinitely customizable design. When deciding on how to customize a design, first consider whether you want the sword to be on its own or as part of a larger scene. In either case, you should then work with your tattoo artist to come up with ways on how to customize the colors, patterns, and size of the tattoo to best reflect your own personality, culture, and preferences. The famed sword that the Lady of the Lake gifted to King Arthur, Excalibur is known the world over as a symbol of kingship, power, and might. The magic associated with this sword is especially potent, and if you choose to get a tattoo of Excalibur some of that power might just transfer to you! One design choice is to have the Lady of the Lake holding the sword in her hand as her arm rises out of the water, a clear indication that your tattoo is of Excalibur and not just a regular sword. Another legend about the sword has it trapped in a stone before Arthur pulls it free; another design choice could therefore show the sword in the stone, perhaps with a luminous glow around it to demonstrate the magic it contains. 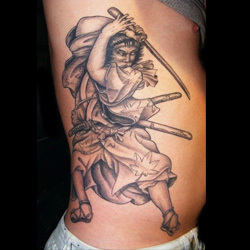 A tattoo of a samurai sword can either stand alone or be a part of a larger samurai tattoo. In either case, the sword should have a long and narrow blade that slightly tapers at the end, with the hilt wrapped in a distinctive braided fashion. For further personalization, include a phrase or word in Japanese beneath or around the sword, or place the sword in a scene with other images from Japanese culture to demonstrate your heritage or interest in Japan's history. 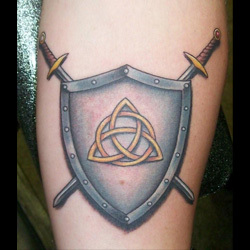 Swords that are crossed often symbolize unity, an alliance, or the joining together of two families, as in the heraldic tradition. 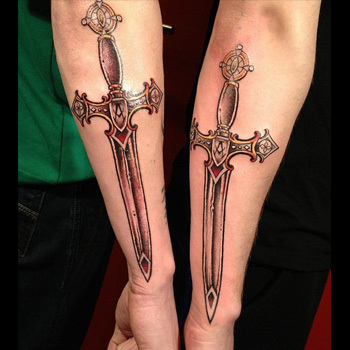 Therefore, crossed swords is a particularly great tattoo design for couples wishing to demonstrate the unity of their two families when they get married or commit to one another. Customize the tattoo by creating a distinct design for each sword, one representative of one partner and the other sword representative of the other partner. Often carried by angels, flaming swords are a great tattoo for proclaiming your Christian faith in a unique and powerful way. The flaming sword can be on its own - the back of the leg and forearm make great spots for this tattoo - or be held by an angel as part of a larger scene. When paired with an angel, this sword can demonstrate your willingness to fight for your faith as an angel in battle. Personalize this tattoo by playing with the design of the sword and angel: you may want to replicate a certain sword from a biblical painting, or have the angel be representative of a certain saint or holy person you admire. You can also consider using vibrant colors for the flames to make this tattoo stand out even more. This design is also connected with Christianity: winged swords were often seen as a symbol of an individual's archangel protector, and this was a popular symbol among Crusaders during the Middle Ages. 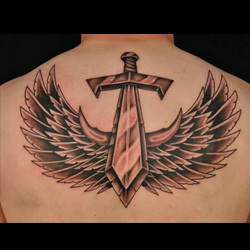 Getting a winged sword tattoo can be a way of reminding yourself that your guardian angel is always with you, watching over you through battles both big and small. You can also get this tattoo in memory of a loved one who has passed away, and who you know is looking down on you from heaven. Consider getting the individual's name or birthday tattooed underneath or around the sword to further personalize this design. A tattoo of a dragon and sword can demonstrate your Asian heritage, or represent the conquering of a foe. In myths and legends, heroes had to slay dragons in order to achieve their goals, making these mythical beasts representative of mankind's personal fears and obstacles. Having a dragon curled around a sword can therefore be representative of your ability to overcome such fears and obstacles in your own, modern-day life. If the dragon is paired with a samurai sword, this creates a clear representation of your Japanese heritage or affinity for Japanese culture. In either design, work with your tattoo artist to personalize elements of the sword, such as the hilt, in a way that make it unique to you. A sword through the heart is a common symbol of the pain and despair, the betrayal and hurt that love can cause. Often people might get this tattoo after a particularly hard breakup or divorce, or even after a loved one has passed away, due to grief or heartache. You can do several things to personalize this tattoo, such as designing a unique hilt for the sword or including other images such as an arrow through the heart to symbolize a double amount of pain. 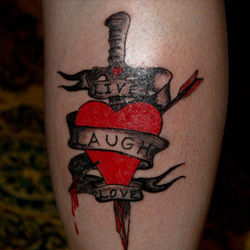 Another way to make this design unique is to include script on a white scroll going across the heart: this can be an uplifting phrase such as 'survivor' or 'live through the pain', or simply read 'true love' to further clarify what the heart stands for. 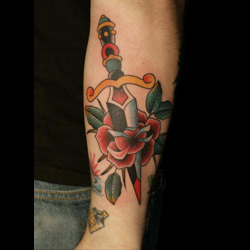 The rose and sword is a popular tattoo design among both men and women. 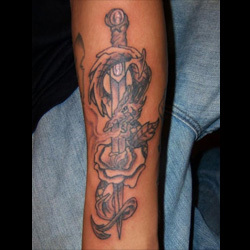 A series of roses encircling a sword can demonstrate the power of love and its ability to quell conflict, while a sword piercing a rose can indicate heartache and loss. Red roses are the most popular in this design, but consider using other colors as well: each color rose has a different meaning (red for love, white for purity and innocence, yellow for joy and friendship, and pink for happiness and admiration) so choose from one or several of these colors to best convey the personal meaning this tattoo has for you. This is the ultimate tattoo for a seasoned veteran, military historian, or anyone who sees themselves as the protector of their family and loved ones. But the dual imagery of this tattoo also demonstrates the potential vulnerability of the individual: the shield is necessary to protect one from attack. Depending on your cultural background, family history, or personal interests, several different designs can be created using the sword and shield motif. For genealogy fans, a sword or pair of swords can form the backdrop of your family crest, while having a sword paired with a shield featuring a red cross is emblematic of the Crusades and Christianity. The symbol of the skull and crossed swords is one often associated with piracy, and by extension the freedom offered by the high seas. It can also have a more vicious meaning: when this symbol was raised, it meant that ships should 'surrender or die'. This design is often done as a full 'Jolly Roger' pirate flag, and looks great on nearly every part of the body, as it can be adapted to be both a large or small scale image. Another option for the skull and sword tattoo is to have a sword going through a skull from the top down. 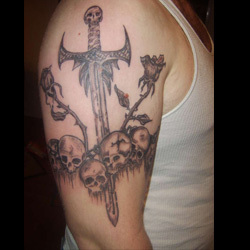 This design can be symbolic of an individual's conquering of death, and it can be customized by adding an inspirational quote underneath the skull or around the sword. 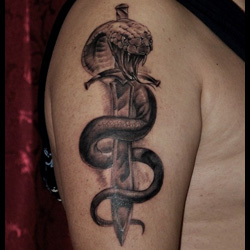 A snake wrapped around a sword is the universal symbol for healing, medicine, and medical professions: this therefore makes a perfect tattoo for any doctors, nurses, or EMTs! To further promote the symbol's medical connotations, consider getting a line from the Hippocratic Oath, such as "first do no harm": this oath has been sworn by physicians for thousands of years and including a line in your tattoo can serve as an important reminder of your duty of care to your patients. This quote first comes from Jesus, who spoke it as a warning to those who use violence: 'those who live by the sword, die by the sword'. 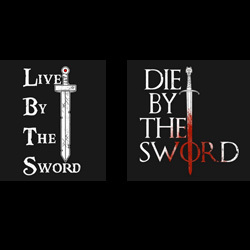 This phrase can also be adopted by those who understand the dangers of battle but are still willing to walk into the fray, and thus a tattoo with this quote (and optional sword imagery) can be especially symbolic to current and former members of the armed forces. If you have lost a family member or loved one in the military, consider personalizing this tattoo by including their name or birthdate in the design. Sword tattoos can be easily adapted to fit almost any body part - whether you want a panoramic battle scene or a single blade, these are great tattoos for both men and women! 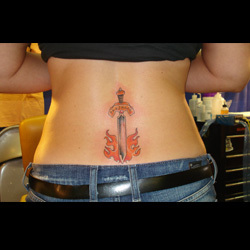 For custom design of a Sword, you can check our Custom Tattoo Page.